That title is so much drama, but it’s genuinely how I feel. Kotor was brilliant and romantic and empowering and life-giving. After saying goodbye to Crystal that morning in Podgorica, I got on a bus to Kotor. I could probably write an entire essay on the bus ride alone. It was stunning to see Budva and Sveti Stefan from above and to wind down along the coast. Dazzling. When I arrived in Kotor I followed the adorably vague (but effective) directions to the hostel: walk towards the water, turn right at the yellow house, walk under the stone arch, etc. The hostel was inside the walls of the old city, and it has tied for first (along with Little Big House in Thessaloniki) for my favorite hostel I have ever stayed in. Everything about it was completely charming. For the first time in two months I was alone and I wasn’t sure how I felt about that. But I did what I normally do when I travel alone: I wandered. I walked through the old city for a little more than an hour absorbing all that I could. There was a British cruise ship docked in the harbor and so all of those tourists were swarming through the city as I walked, which I got tired of quite quickly. So I left the old city, went to the grocery store, and then found a little place to sit by the bay where I wrote for a while. Everything I saw inspired me. In the evening, I went out with some people from the hostel and sat on the steps of a pub talking until midnight. I felt calm and happy and young. The next morning, I woke up at 7 am and went to hike the mountain behind the city. There is a castle part way up and behind that the ancient road that zig-zags up and over the mountain connecting Kotor to other cities. I hiked for 6 hours and it was glorious and empowering. I didn’t encounter many other hikers which I preferred. I did meet two American guys who lived in Albania. They were biking down the trail (which seemed like an impossible thing to do because of how torn up the road is). They were impressed that I was hiking by myself which made me feel kind of cool and a little bit like Cheryl Strayed. Halfway up the mountain I encountered a little house where a Montenegrin family lived. I stopped there for some tea and a sweet 13-year-old girl who spoke perfect English gave me a colored egg for Orthodox Easter. I talked with the girl for a while, asking her about school and her family. She told me she had learned English from all the tourists that had come by her house her whole life. When I arrived at the top of the mountain, it felt like a dream. The view was surreal. Kotor bay is gorgeously blue. The surrounding mountains are intimidating and sublime. I could have stayed up there for days. The mountain gave me power. Even the air made me braver. I came down from the mountain so reluctantly. I smelled terrible, my feet were sore, and my back hurt. But it was the best kind of pain. Soon I will write a love poem to that mountain. I was late coming back so I wolfed down a pizza, checked out of the hostel, and went to the bus station to start the trek back to Kosovo. I cannot say enough good things about Montenegro. The people, the seaside, the mountains, the views. All of it was overwhelmingly sweet and good. I know I’ll be back soon, if only to make sure it really exists and wasn’t all a dream. It was a perfect few days, a peaceful sabbatical that I didn’t know I needed. 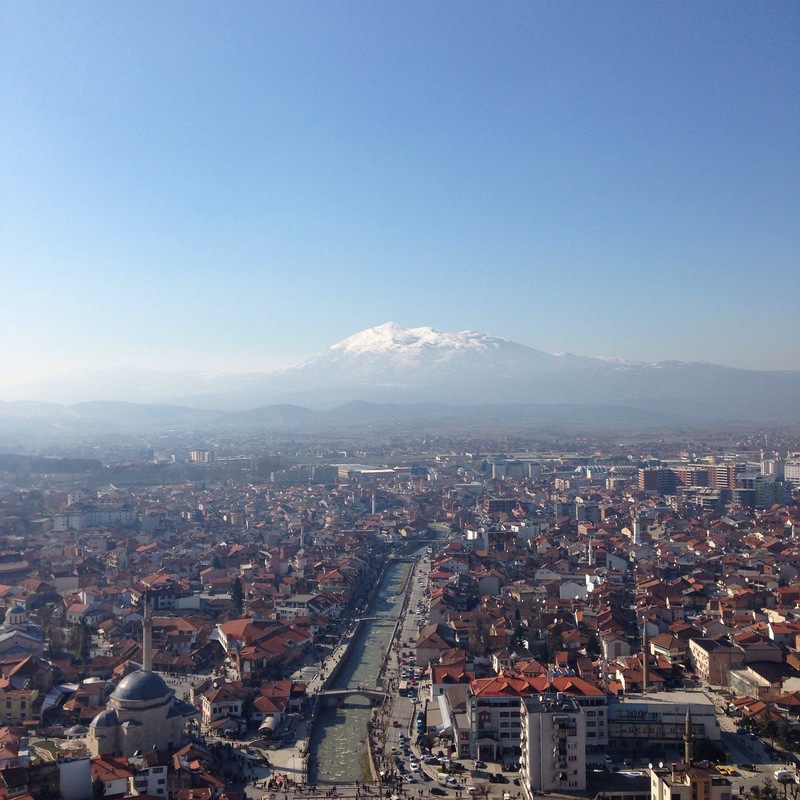 I just love the Balkans. Favorite Cafe: If you can count the family’s home on the trail up the mountain, then that. Favorite Thing I Did: Hiking hiking hiking. Crystal and I were incredibly sad to leave Ulcinj, but she had a flight out of Podgorica, so we took a beautiful bus ride along the coast and through the mountains to Montenegro’s capital city. 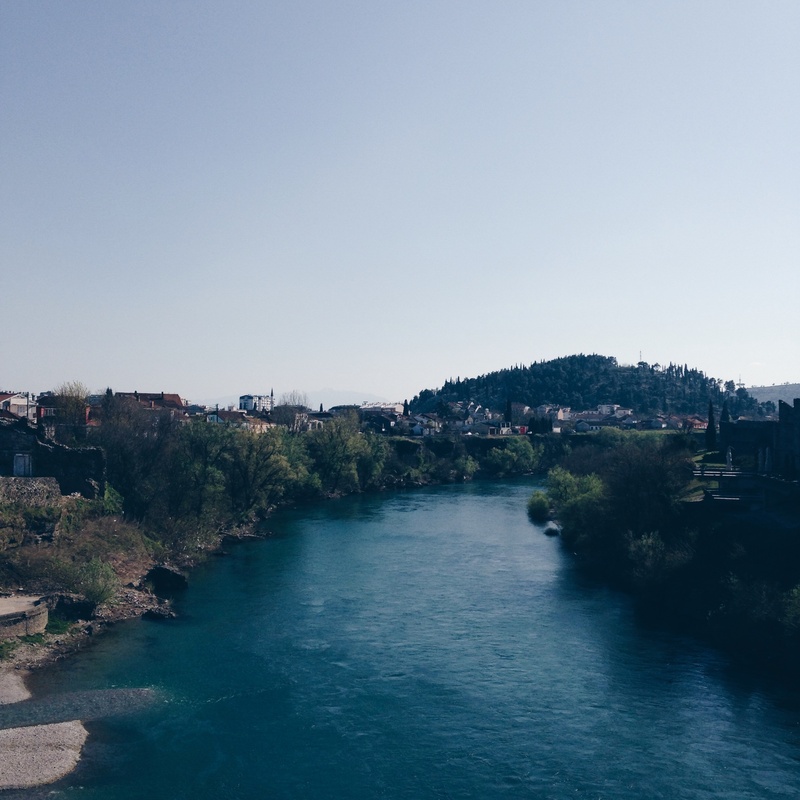 I had read before hand that as far as cities go, Podgorica was pretty dull. I get that. There’s nothing much to see there really (except giant transformer-like sculptures everywhere…? ), but the river and the surrounding mountains make it beautiful in its own way. We stayed in a great little apartment-turned-hostel with the friendliest and most helpful owner. 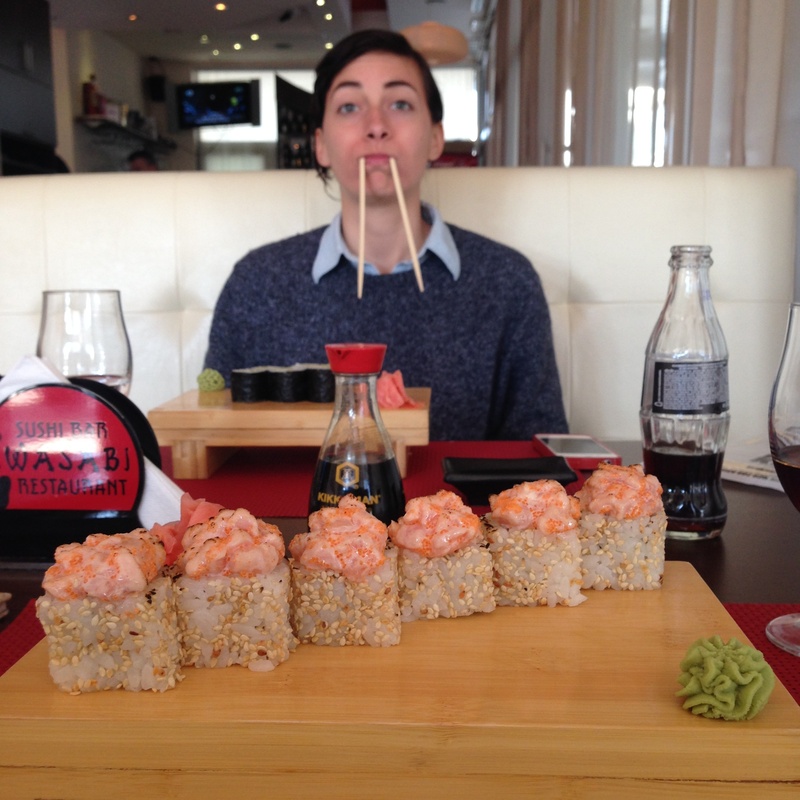 We found a sushi restaurant which was heaven, and we also found a thrift store which made Podgrocia the most wonderful city in the world to me at that moment. 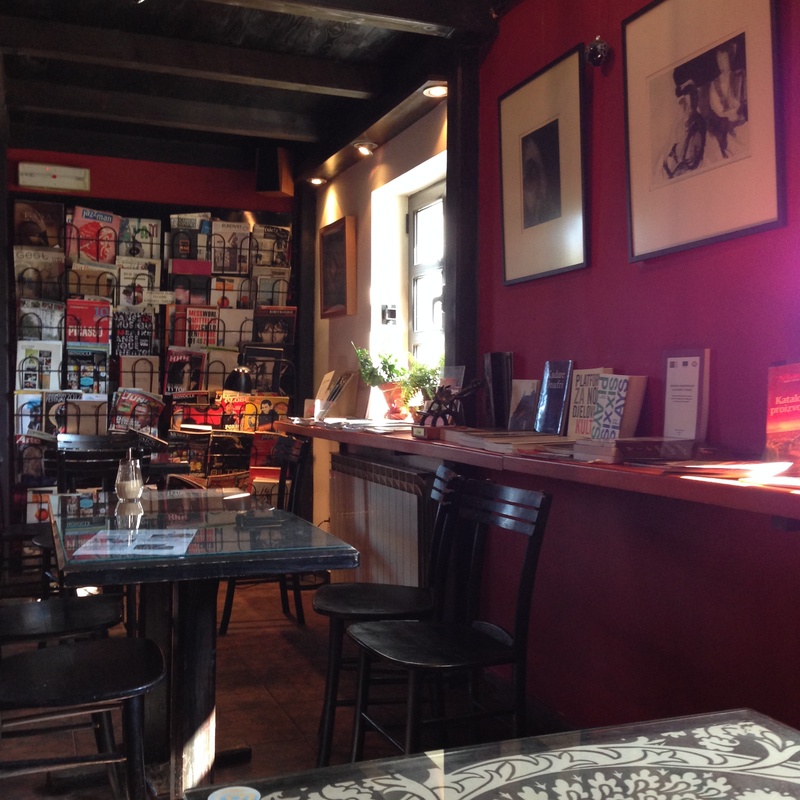 The best thing in Podgorica through, has to be the cafe/bookstore, Karver. 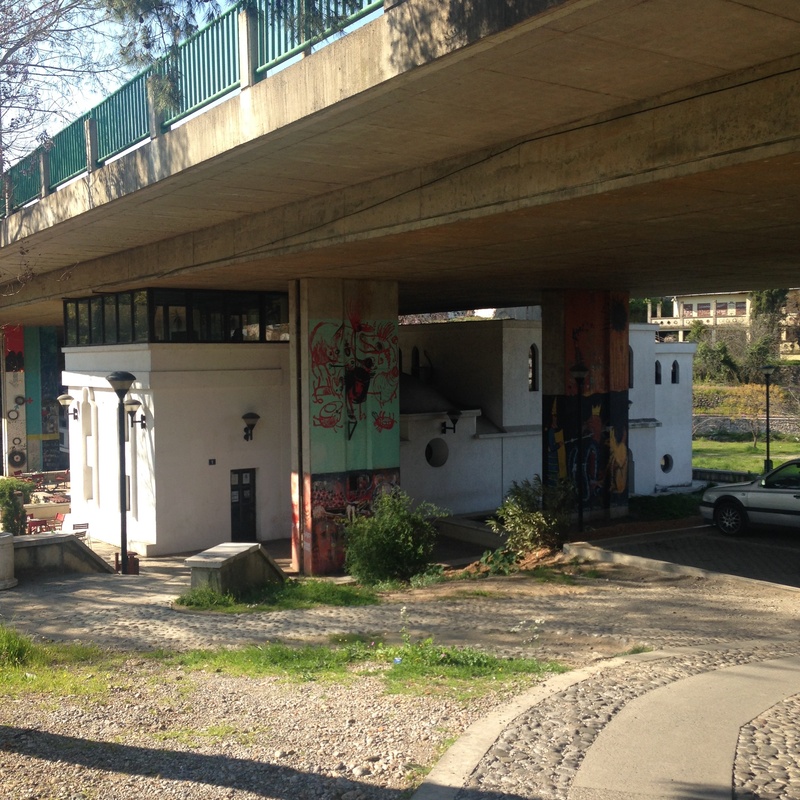 It is situated by the river and underneath a bridge, surrounded by green space and beautiful blooming trees. 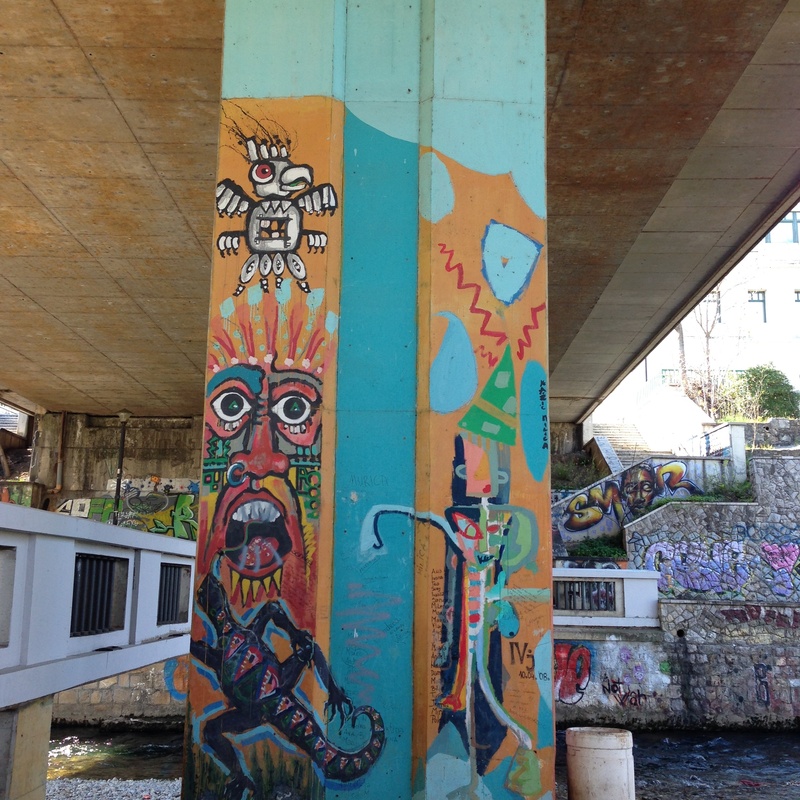 There was cool, colorful graffiti covering a lot of the bridge which reminded me of the Atlanta beltline. 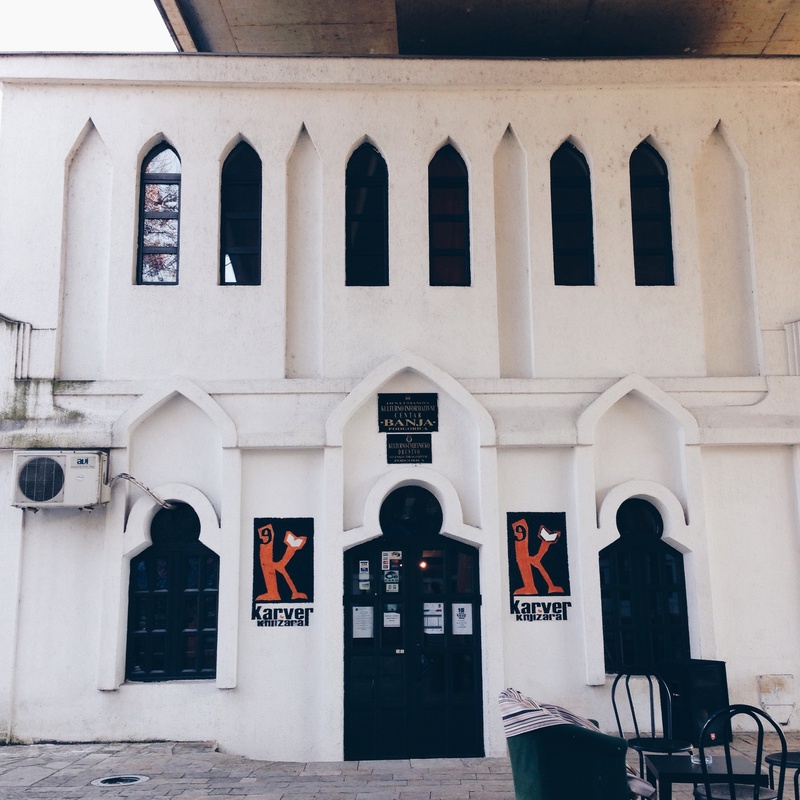 The cafe itself is actually an old turkish bathhouse that has been converted into a coffee shop and bookstore. It is the loveliest. I went there three times during my brief stay in Podgorica. One night was their anniversary so they had live jazz and a very young eclectic crowd. It’s a fantastic place. 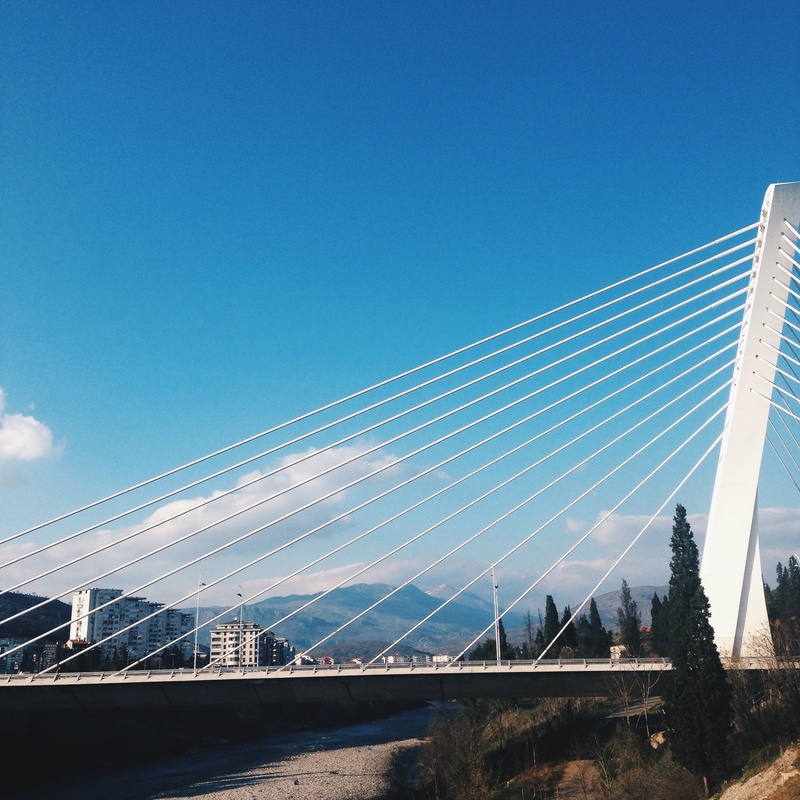 Thanks for being you, Podgorica. I’m going to make a bold statement: Montenegro might be one of my favorite places I’ve ever been to. I think it came at the right time for me. I was tired from the cold and the snow and the English teaching. I just wanted to go somewhere. Crystal was flying out of Podgorica on a Friday, and so on a Tuesday we decided to shake the icicles off of our eyelashes and head to the Montenegrin coast. 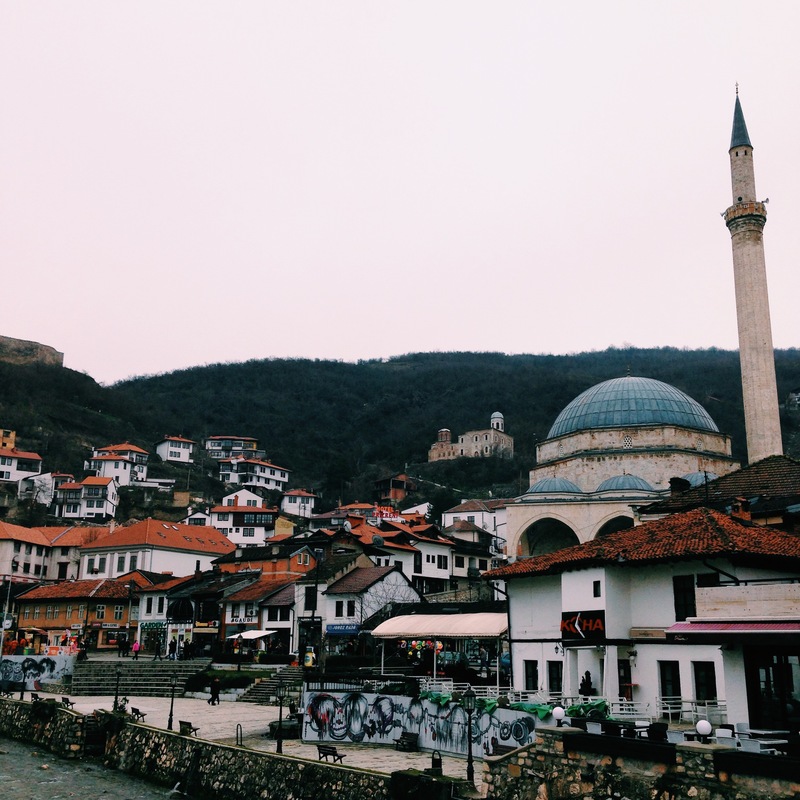 At 10 pm we went out and waited on a very cold street corner in Prizren for 45 minutes, were mistaken for prostitutes twice, and finally loaded onto a way too crowded bus for a 5 hour bus ride to Ulcinj, Montenegro. It was about 4 am by the time we got to the bus station. We talked for a minute about getting a hotel room, but the sun was going to come up soon and we didn’t feel like spending the money, so instead we walked in the direction of the sea. After a lengthy stop at a 24 hour bakery and a near miss with a suspicious police officer, we made it to the beach and dropped into the sand. There we laid, shivering, for an hour and half until the sun came up. Once the sun was up we wandered around looking for a warm place to sit. We felt like hobos. A little old Albanian man welcomed us into his tiny cafe and made us Turkish coffee. He was very proud of his single English phrase: “Good morgan!” He said it over and over to us, but we didn’t have the heart to correct him. It was still too early to check into the place where we were staying so we stopped at another cafe where a group of old men was sitting around smoking and drinking coffee. They gave us free macchiatos and let us sit there for a long time warming our little hobo-selves. The home we stayed at in Ulcinj. Finally, we were able to check into the little room in an apartment that we had found online. A sweet old lady who spoke no English welcomed us and gave us juice. We napped most of the morning and after showers and food, we were finally able to appreciate where we were. And by the way, Ulcinj is glorious. We walked through groves of olive trees, climbed rocky cliffs along the sea side, and got lost in the winding streets of the old city. It was the dreamiest two days in Ulcinj, Montenegro, a city with the kindest old people and the bluest water I have ever seen. Best place I ate at: We didn’t really eat out because it was a bit expensive, but you can never go wrong with byrek. 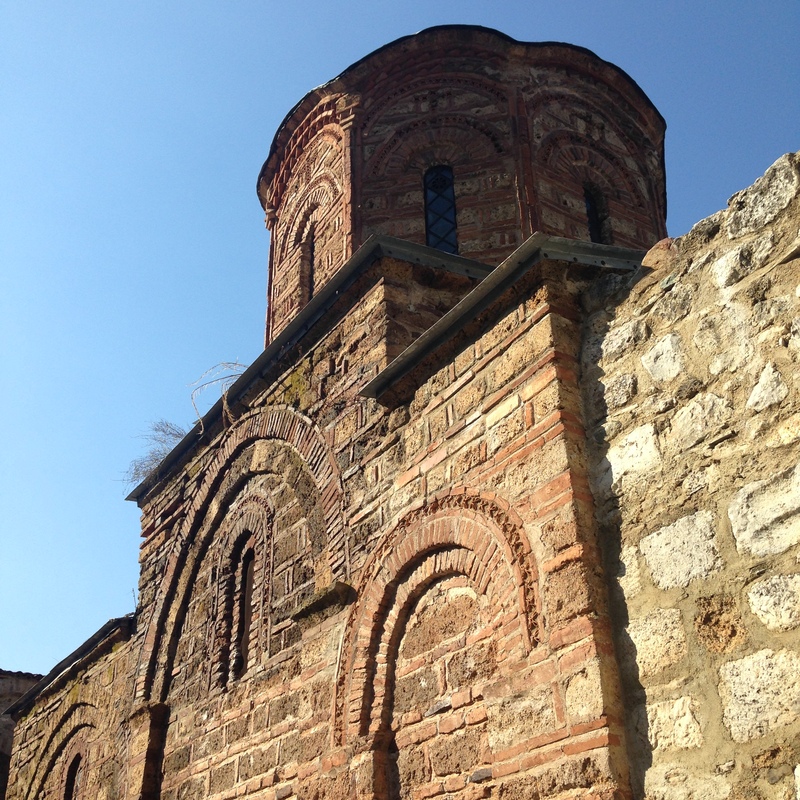 And so went our weekend trip to Thessaloniki [θesaloˈnici]. Equal parts DIY adventure and authentic encounters with Greek culture. We ate good Greek food and drank sweet Greek wine in cozy Tavernas with the bearded Greek waiters dancing and shouting “opa!” in the Kitchen. We stayed in the quaintest, coolest hostel and sipped green tea from its rooftop. We climbed up ruined castle walls and walked the length of it until there was no more wall to walk. We went to Starbucks (because I’m an American who lives in a Starbucks-less country and I can’t help myself). We walked through old cemeteries, ancient churches, quiet cobblestone streets, and down along the Mediterranean sea. 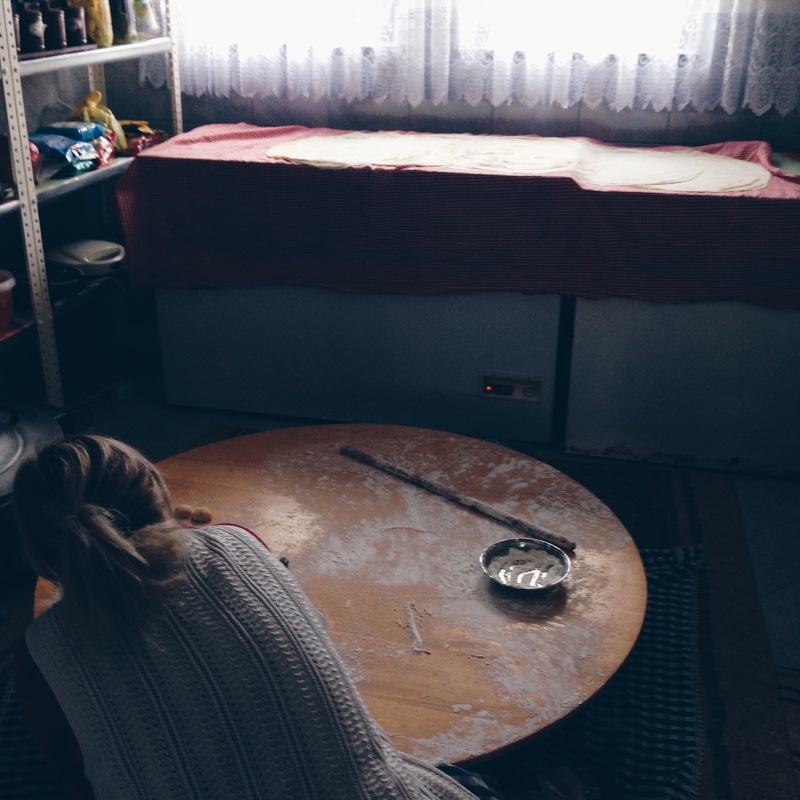 We went into a bakery at 1 am and “helped” the Albanian bakers make bread for the next day (and we ate a lot of free bread). Two days wasn’t nearly enough. Love you, Thessaloniki. It’s been cold and snowy the past few days and I’m going to be honest with you, now that it’s March my mild annoyance of the snow has turned into something close to hatred of it. I’m sorry, in 10 months I promise I’ll be excited about it again. Lately my life has been so full of beautiful friends, mini-adventures, and bread. So this is me taking a moment (as I sip Emergen-C because this is also reality). I’ve loved these months here and I love a life movement. The sun will bring more adventures, so spring please come soon. So, I’ve been told that people want to know about my life. 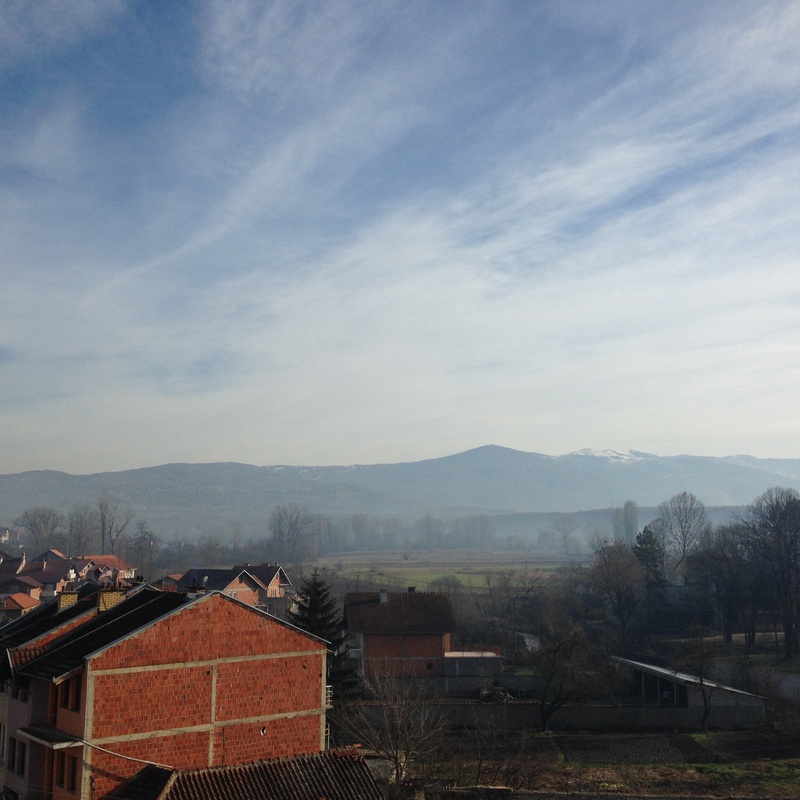 Not my whole life (that would be boring) but my Kosovo life. 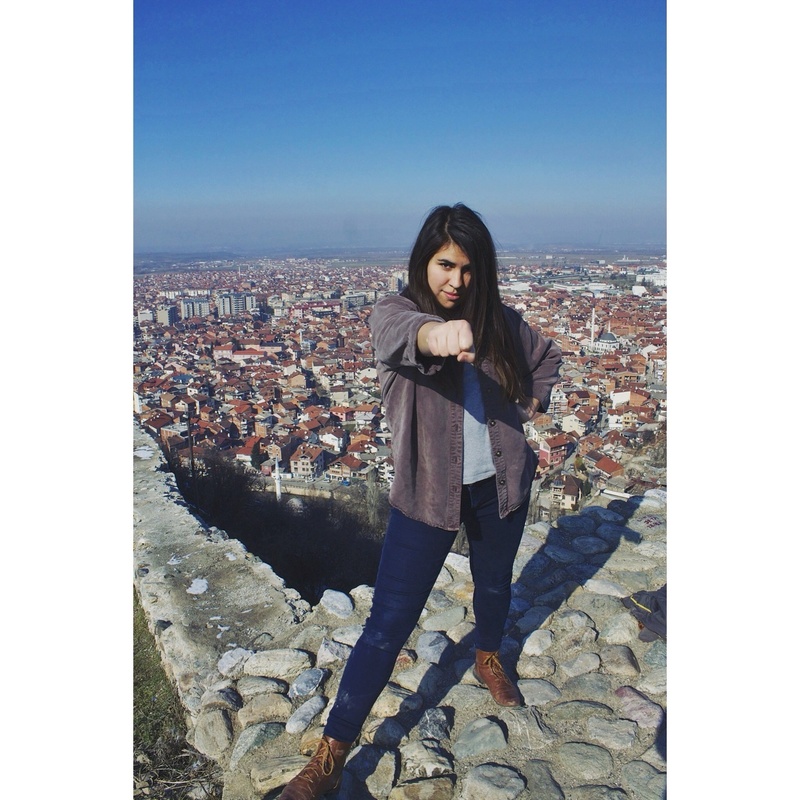 Kosolife, if you will. I guess that’s fair. 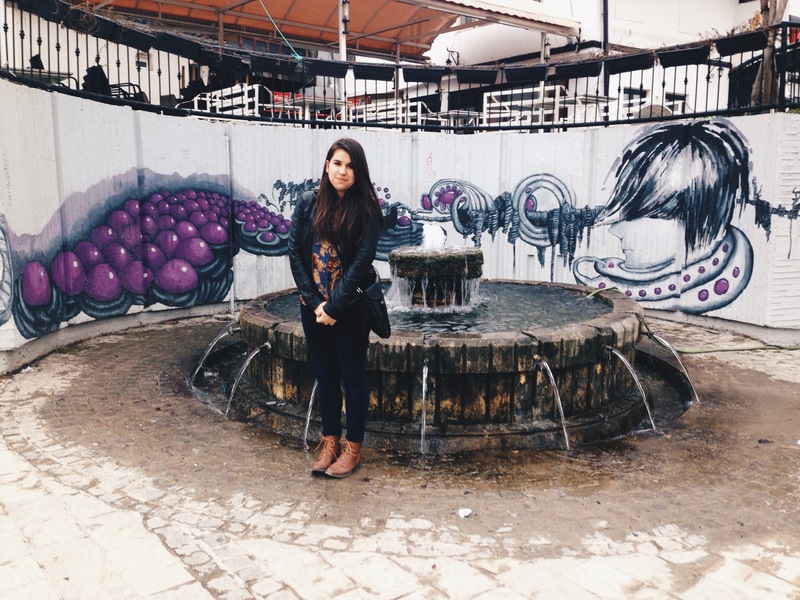 I love hearing about other people’s adventures in countries and cultures different then my own. I’m also a writer and we all know that writers will take any excuse to write about themselves. (Except for George MacDonald because he’s perfect). So I’m going to try and update you on my little adventures and my day-to-day life. After living in a village for the first bit of time I was here, I moved into a snazzy little zebra palace apartment in town with glorious views of the mountains. It’s the fifth floor, broken elevator. When I first saw the apartment it looked like someone had killed a dozen zebras and used them to decorate the whole thing. I totally love African animals, but it wasn’t quite my style, so I’ve been doing little crafty projects and buying a few things here and there to make it look more 23-year-old-who-loves-nature-and-travel-but-doesn’t-like-to-clean. I think I’ve achieved that for the most part. Once spring comes, I’ll fill it with plants and it will be perfect. 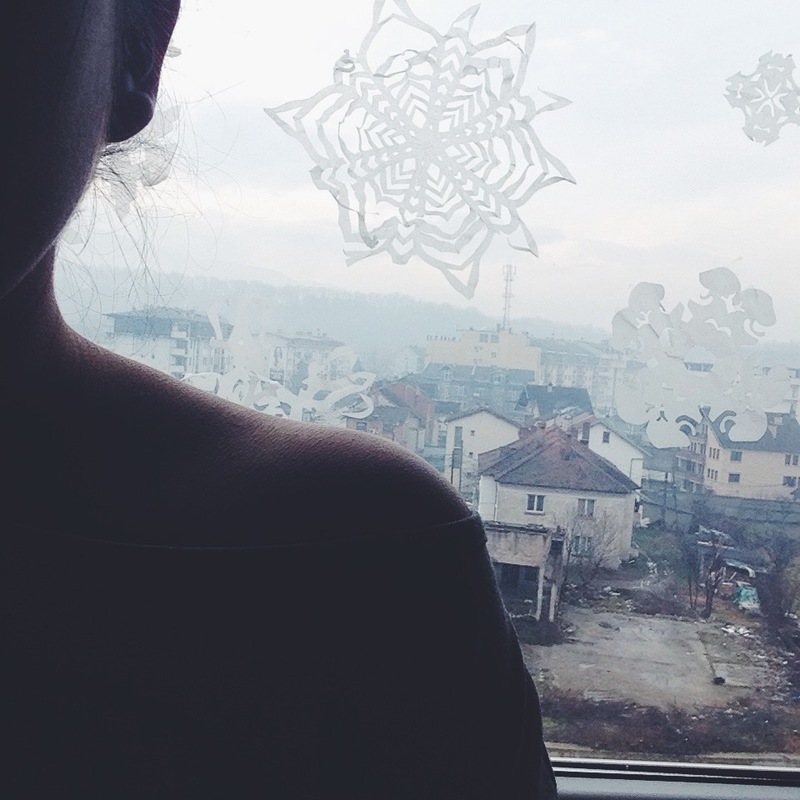 Fun thing about Kosovo: power outages. I’m no stranger to power outages, because I spent 6 months in Lebanon (shout-out to my homies). When the power goes out I just shrug and turn on my iphone flashlight. It’s actually kind of nice because it forces me to unplug. I get a lot of writing done during these times (example: the power is out right now). Many people want to know “what do you do here?” Well I mainly do three things. I help out in the ballet class in Suhareke. I love it! I love doing choreography. I love being around dancers. I love performances and performing. It’s so fun to be back in that world. I teach English. I teach three classes a day, three days a week. And I love this too! I <3 English. And I <3 teaching. It’s fun to be able to create my own lesson plans and activities. I’m not the best disciplinarian and I know that will catch up to me, but right now it’s great. 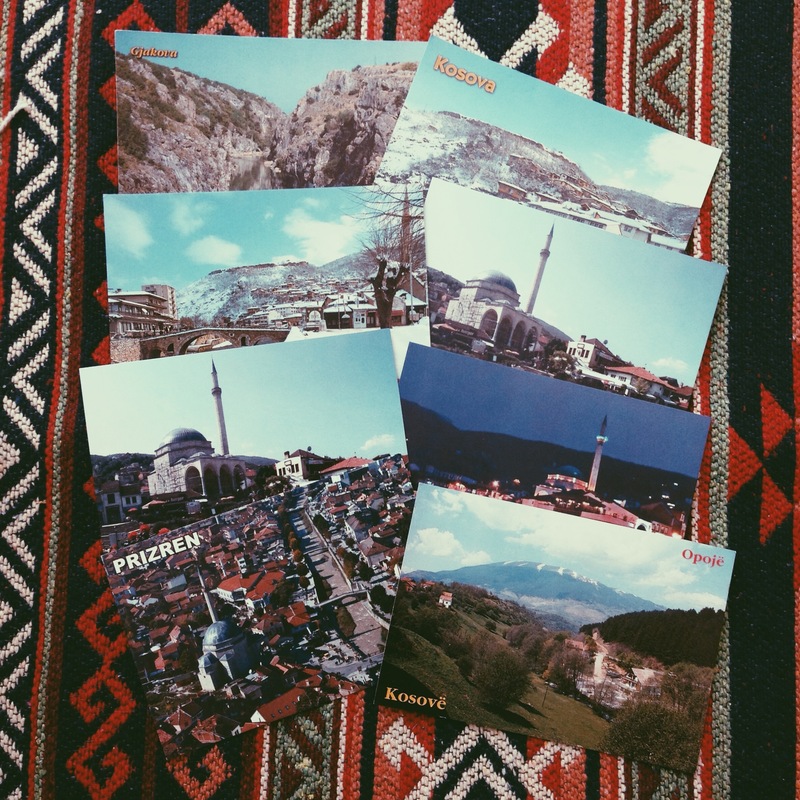 This week we wrote postcards to people I know around the world (thanks guys!). We also talked a little bit about Martin Luther King Jr.’s “I Have a Dream Speech,” because I think this is important no matter where in the world you live. The third thing I do is study Albanian. I’ll be honest; this week hasn’t been as strong as others. Albanian is super hard and I still can’t figure out the grammar. But I’m memorizing things and listening a lot. Some days I’ll be super independent and know what I want to say and how to say it. Or I’ll totally understand a conversation that is being had near me, and it’s awesome. But other days, I fail completely. Like Tuesday, for example, when I went to the outdoor market knowing I wanted to get fruit, but then I totally blanked and got really intimidated so I left empty-handed and defeated. Ah, language learning, you fickle friend. I’ve settled into life here, and it’s good. 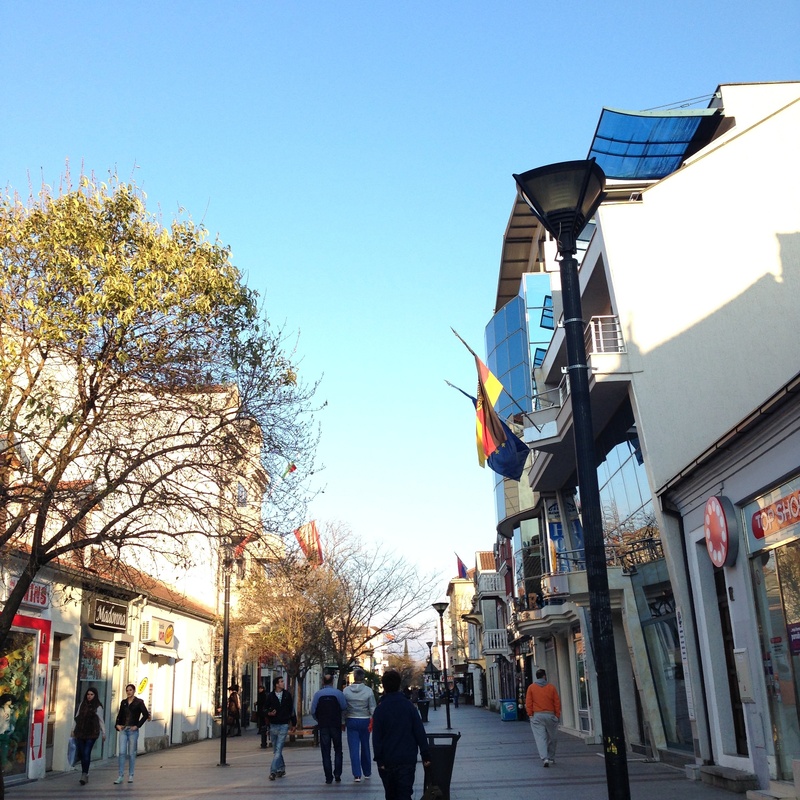 I visit Prizren almost every week. I’ve gotten tired of the snow. I will never get tired of the mountains. It has been a great first two months, and I know that the next two months will be even better. I don’t know what I did with my list of New Year’s resolutions for 2014. Probably it’s somewhere tucked away in my bedroom at my parents’ house. I know I made one, because I always make one. I’m addicted to lists and checking things off of lists. But I’m also addicted to chaos and unpredictability so a lot of things don’t get done and other things happen that were never planned. I always have some of the same things written on my list every year. Run a half marathon. Read all the books on my bookshelf. Fall in love with something/someone/someplace. And I never seem to get around to doing them. This year has been the most uncertain year I have ever lived. Nothing got done, but everything happened. My steps were shaky and the ground was unsteady as I picked up and moved across the world, then went back and did it all again. I had a quiet voice that didn’t speak up enough and a fickle heart that refused to fall in love in the right way. In 2014 I was a mess, but you know what, in 2013 I was a mess too. Why is it that at the start of every new year, we think that this will be the year we’ll suddenly find our way? I don’t think I accomplished any of the things on my list for 2014. I did not become a runner. I didn’t read all of the books in my bookcase. And I did not fall in love in the way that I meant it when I wrote it down a year ago. However, a year has gone by and I am different, but also the same. I write less, but dance more. I eat too much chocolate, and I walk everywhere. I don’t shower enough and I make too many lists. I talk too much or not at all. This year I asked more questions. I sought peace and freedom. I stood up for myself once (I should do that more). In 2014 I didn’t fall in love, I found it. Again and again. Through every person and place that crammed itself into my heart. This year, like every year, was the year I changed and also didn’t. I’m a little nervous to make resolutions for 2015, but I probably still will because how else will I keep track of all the things I don’t do? But here’s a little flash back of some of the things I did do in 2014. Binge watched Gilmore Girls, Parks and Rec, and Sherlock on Netflix. Ripped my favorite pair of pants and my friend got it on video. Watched Breakfast at Tiffany’s for the first time. Did not get the hype. Ate more crepes than I want to admit. Stopped keeping track of the time as it passed.